A Harvard linebacker turned developer, Chiofaro introduced himself to Boston 35 years ago with carnival flair and kinetic force. He walked into a City Hall meeting wearing his old Harvard jersey and blasting the Rocky III soundtrack. He decimated a parking garage on Super Bowl Sunday 1985. Then he made a TV commercial of the implosion, announcing his plans to build Boston’s tallest building of the ’80s—International Place, a million-plus-square-foot office complex overlooking the Greenway that kicked off a new era in the city’s development. “He liked to be the center of attention,” says Peter Berg, his former classmate and a friend since age 15. Chiofaro’s flair for theatrics even inspired author Tom Wolfe’s linebacker/developer character Charlie Croker, protagonist of his mega-novel A Man in Full. 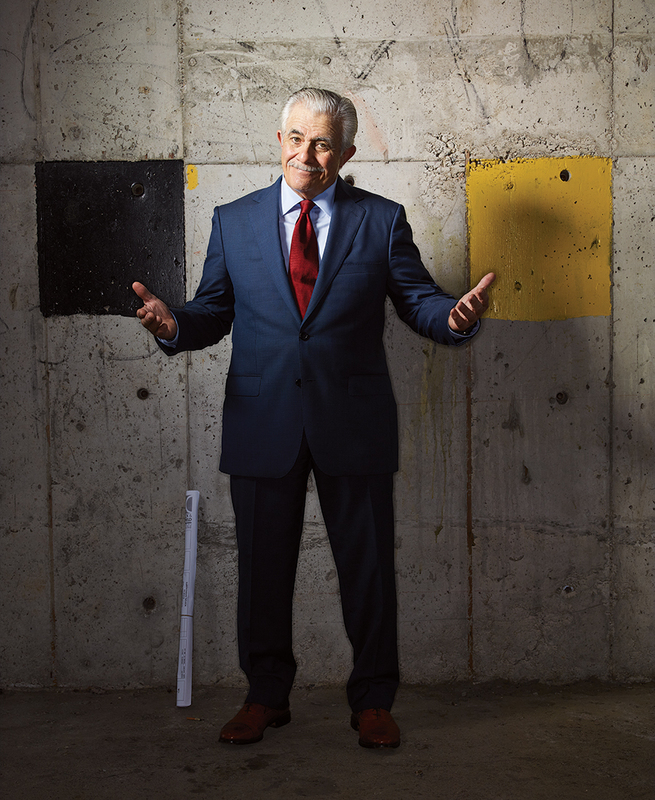 Now, at 72, Chiofaro wants to build the sequel to his signature achievement and cement his legacy in this town forever. For years it looked like Chiofaro would never get to build his castle in the sky. In an epic battle of Boston power politics, his ambitions were blocked by a man even more steely than he is: the late Mayor Tom Menino. Their feud was legendary, a media war of press conferences, cutting quotes, and even a Godfather parody video. Today, though, Chiofaro is facing a new Boston. Former construction laborer Marty Walsh is in the mayor’s office, and after years of negotiation, Chiofaro won city and state zoning approval this year to build up to 600 feet—higher than anything else on the waterfront. He is inching his dream project closer than ever to reality. Still, Chiofaro’s battle is far from over. In July, residents near the garage and the Conservation Law Foundation filed lawsuits to chop down the building’s size, arguing that it’s too big for the ocean’s edge. 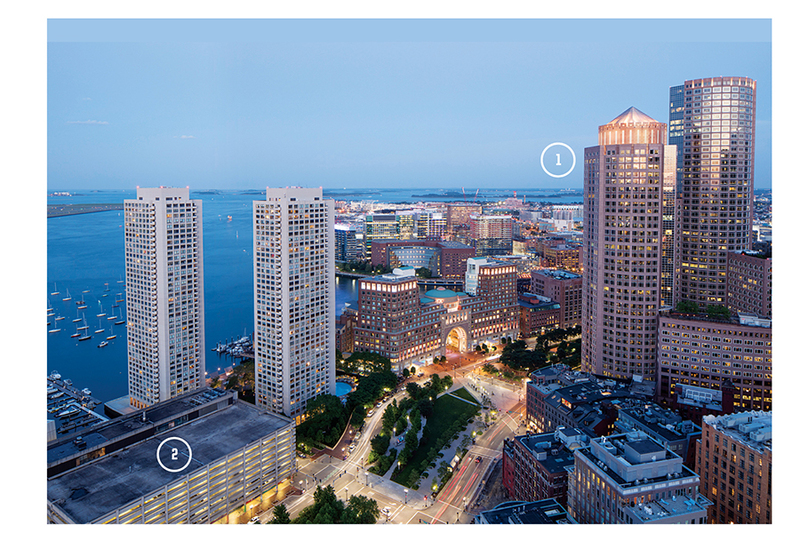 Though steeped in the legal arcana of Massachusetts’ waterfront laws, the lawsuits pose an almost poetic challenge to Chiofaro the man: The key regulation says new buildings on the waterfront have to be “relatively modest” in size. Can Don Chiofaro even do “relatively modest”? The very idea clashes with his self-image, his ethos, his drive—the fuel of his past achievements. In what is perhaps a cruel twist of fate, though, it could be the key to whether, late in his career, he can once again leave a lasting signature and transform Boston’s skyline. From the start, Chiofaro was always “an enormous personality,” Berg says. He grew up in Belmont, the son of a beat cop, and enjoyed repartee, “sitting around the room and getting under people’s skin.” Even then, he was driven to achieve, Berg says, and befriended intellectuals, athletes, and professors alike. His lifelong Harvard friends include actor and former football teammate Tommy Lee Jones. “Don was a combination of a very mature person with someone who enjoyed the battle,” Berg says. 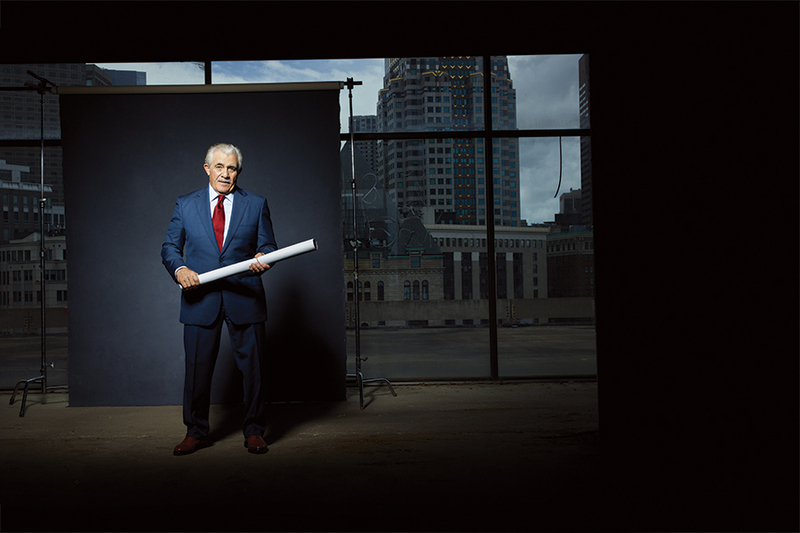 After earning a Harvard Business School MBA in 1972, Chiofaro went to work for the star real estate firm Cabot, Cabot & Forbes. He spent the ’70s developing buildings across the country: warehouses, research parks, a Paul Masson wine-aging facility in California. But he wanted to build something bigger. He wanted to make his mark. Don Chiofaro altered the city’s skyline by building International Place (1) in the 1980s. Now he’s determined to do it again at the Harbor Garage (2). In 1980 Chiofaro set out to build a skyscraper as big as his ambitions. 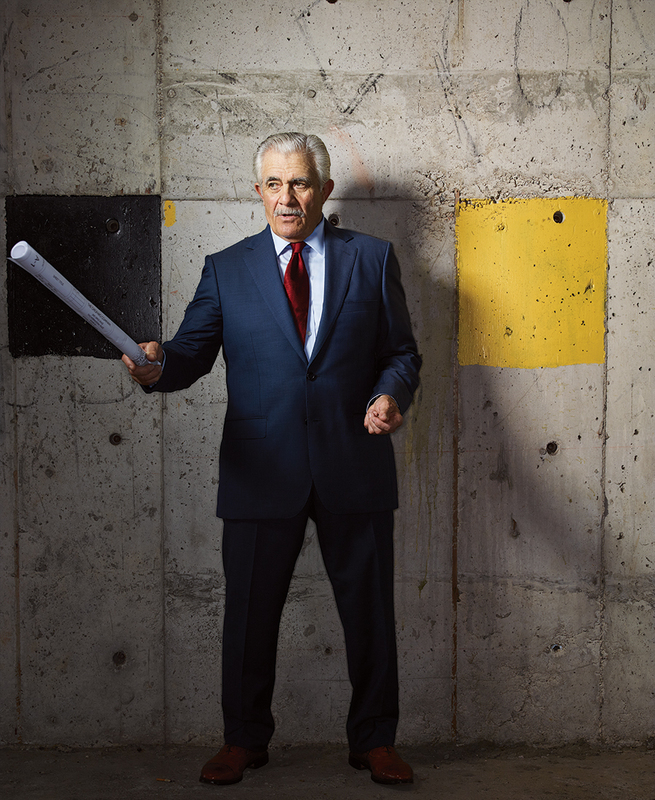 While working on a development in Westborough, he teamed up with Pittsburgh billionaire Henry Hillman to build an office complex in a forsaken part of downtown Boston next to the Central Artery. The site was a puzzle: 14 lots, a garage, and little buildings, with different owners, on two city blocks. “I see a really complicated problem,” Chiofaro said, “and see an opportunity.” Armed with a box of cigars, he persuaded one parking lot owner to sell. The others followed. Playing off White’s fondness for calling Boston a world-class city, Chiofaro dubbed his creation International Place. With White’s backing, Chiofaro announced his plan to build the 2-million-square-foot complex in fall of 1983. He was 37. “He was an unknown,” Berg says. If the 1980s were Chiofaro’s decade, the 1990s and 2000s decidedly were not. International Place’s second tower opened during the early ’90s, and Chiofaro had to fight his lender in court to keep it from reneging on a loan. His attempts to build in Boston again failed: In 1999 he was booted off an office-tower project near South Station after his partners and city officials decided he hadn’t made enough progress. Less than a year later, Chiofaro lost the right to develop a Seaport parcel when his prospective tenant bailed—and signed instead with the developers of the project near South Station that Chiofaro had been removed from. Chiofaro’s bad luck continued. In 2004 he even came to the brink of losing his beloved International Place when a New York City firm bought the loan on the building and attempted a “hostile” takeover. Chiofaro declared the firm “a gang of pirates” and vowed to “send the interlopers back to Gotham.” And he did—by filing for bankruptcy protection and getting a new financier, Prudential Real Estate Investors, to take a 90 percent stake in the complex. Furious and bullheaded, Chiofaro turned the fight into a public sideshow. He hung a giant red X on the garage’s side, with a white sign that read, “Open to the Sea”—to remind Bostonians of the space he’d open up if he got permission to develop. When critics said Chiofaro had a tin ear, he Photoshopped an image of himself as the Tin Man from The Wizard of Oz. Menino answered with plans to limit new buildings on the waterfront to 200 feet. “I don’t want to Manhattanize the Greenway,” the mayor said. Chiofaro fired back again, holding a press conference at International Place to blast Menino. “We intend to keep the pressure up until we get honest answers from the person pulling the strings on this process, and we all know who that is,” Chiofaro declared. In 2013 it looked like Chiofaro would never build in Boston again. Then Marty Walsh was elected mayor, and everything changed. At the annual fundraiser for the nonprofit Boston Harbor Now on Spectacle Island, Chiofaro strolls past the celebrity-chef hors d’oeuvres tables. Around him flows the professional class of Boston’s waterfront world: fellow developers, lawyers, consultants. He says hello to two young guys, both state regulators—he can’t remember from which agency. “This is the intersection of everybody that’s involved in my deal,” says Chiofaro, scanning the crowd. He means the Harbor Garage project: its friends and its foes. It’s hardly a secret that the mayor, with his union roots, wants development and construction jobs. Since Walsh took office, his administration has tossed aside Menino’s 200-foot height guideline for the waterfront and Greenway. This, more than anything, has opened up a chance for Chiofaro to build his skyscraper on the Harbor Garage site. Walsh has been a friendlier face in City Hall than Menino, but Chiofaro still has plenty of foes, and his great comeback is far from a done deal. From the moment he proposed the skyscraper, he and his project have been under attack. If that lawsuit doesn’t spoil Chiofaro’s plans, one filed by the Conservation Law Foundation (CLF) against the state easily could. The longtime environmental group is a formidable foe that has played a major role in Boston Harbor’s cleanup and has secured transit improvements, including the Green Line Extension, to offset environmental harms wrought by the Big Dig. The CLF also aims to block the new 600-foot zoning height. During the party on Spectacle Island, everyone seems happy to see Chiofaro—except possibly Eric Krauss, chief operating officer of the New England Aquarium, who looks stiff and uncomfortable as Chiofaro chats him up. The aquarium once fought Chiofaro’s project, concerned that tearing up the Harbor Garage would disrupt parking and traffic, scare away some of the institution’s 1.3 million annual visitors, and ruin its business. Aquarium officials have shifted to carefully noncommittal now that Chiofaro has agreed to spend $10 million on the aquarium’s Blueway project, which would create a public promenade from the Greenway to the harbor. Still, hard feelings remain, and aquarium leaders are wary. “We continue to have conversations with Don,” Krauss tells me as Chiofaro leaves to get him a beer. To pull off his soaring comeback project, Chiofaro knows he needs more than sheer willpower—he needs friends. Walsh has not only cleared an early path for Chiofaro’s plans, he’s also shown the developer the blueprints to conquering his obstacles by encouraging him to choose diplomacy over battle. “I’ve had some pretty intense conversations with him about this project,” Walsh tells me, about having “inclusive, open dialogue” with the garage’s neighbors. In other words, the mayor has nudged Chiofaro to change his formula for success. Chiofaro’s big personality, a great match for the flashy ’80s, is hardly a perfect fit for 2018 Boston, where the consensus-building convener is king. As a result, Chiofaro has cut back on the bombast and is learning to play nice, or at least nicer. He’s spent years talking with the city, the state, and the Harbor Garage’s neighbors, mostly aquarium officials and the condo owners in Harbor Towers. “Sometimes it just takes time,” Chiofaro says. “That has become my attitude.” He also attended meeting after meeting about the new zoning rules for the waterfront. Sometimes, Vivien Li says, his answers to questions left people rolling their eyes, and he talked too much about International Place. “He would dominate a room,” she recalls. But Chiofaro soon changed strategy and sent his technical staff to the meetings in his place, letting them answer the endless questions about traffic studies and height, so as not to accidentally annoy. In the process, Chiofaro has also done what he hates most: make concessions. He’s revised his plans, from two towers to one and from as high as 780 feet to 600. He’s agreed to a thinner tower, down from 1.3 million square feet to 900,000 square feet, with more open space around it. And he’s agreed to spend that $10 million to contribute to the Blueway, the aquarium’s proposed path to the water. In early August, he marked off the proposed Blueway space with a painted blue stripe on the Harbor Garage and a new “Open to Sea” sign.